Declaration on coexistence of oil & gas activities and indigenous communities on Nenets and other territories in the Russian North. This declaration addresses principles of fruitful coexistence in northern Russian oil and gas development. It is the outcome of multi-year cooperation and research on the environmental and social impact in northern Russia among stakeholders from reindeer herding, academia, companies and the administration, coordinated by the Arctic Centre, University of Lapland, Finland. While the focus is on the Yamal and Nenets Autonomous Okrugs, we believe the points made here are of wider relevance for the rest of the Russian North and regions beyond. We, the participants of the declaration process, strongly recommend implementation and urge practitioners and decision makers to consider the points made on here in project planning and implementation. Acknowledging that fruitful coexistence of indigenous livelihoods and oil and gas extraction is the expressed goal among all three interested sides in reindeer herding, industry and the state administration. Sharing the will to support one of the world’s most vibrant nomadic group (Nenets) wherever possible, while acknowledging their principle freedom of choice to lead a nomadic or sedentary way of life. For active nomads, relocation to a sedentary life is not necessarily the proper way of compensation. Understanding that valuable lessons have been learned from the exploration and early infrastructure phases of development that enable avoiding or mitigating against the most serious problems during the later infrastructure and production phases. Accepting that passing all necessary legislation helps to institutionalise productive dialogue, and all actors involved need to comply to these laws without exception. This declaration is one of several products of the research project ENSINOR (Environmental and Social Impacts of Industrialization in Northern Russia), which lasted 48 months and ran from January 2004 through December 2007. The overall aim of ENSINOR was the co-production of knowledge that stems from different traditions among both scientists and reindeer herders and their respective ways of knowing about contemporary social-ecological systems. 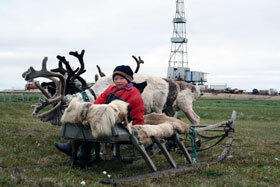 The project undertook a multidisciplinary analysis of the social and environmental consequences of oil and gas development in northern Russia. The core of the project was a comparative study of two key federal districts with large hydrocarbon reserves: the Nenets Autonomous Okrug (NAO) and Yamalo-Nenets Autonomous Okrug (YNAO). The project engaged local stakeholders in all phases of the research: planning, implementation, analysis and dissemination. On 10-11 December 2007 the Arctic Centre held a 2-day workshop involving key stakeholders from northern Russia, Finland, Norway, UK and the Netherlands. Among the participants were indigenous representatives, oil and gas industry workers, NGO representatives, government personnel, and a mix of natural and social scientists. The emphasis of the workshop was on social and environmental impacts rather than technical aspects of development. The goals were to: (1) build trust; (2) establish new and strengthen existing partnerships among diverse groups of local and international stakeholders; (3) provide a structured forum for focused and productive dialogue with direct relevance for policy makers; and (4) provide recommendations aimed at ensuring the long-term viability of social-ecological systems affected by oil & gas activities. This declaration is the outcome of the combined efforts of the researchers and stakeholders. We acknowledge that there is an urgent needfor broad environmental and social impact assessment reaching beyond individually licensed and formally bounded oil and gas territories. Holistic assessments would aim to cover future connections and infrastructure developments throughout the region (strategic environmental assessment). The percentage of land developedto date is still relatively small overall in some regions. However, for some migratory camps a large percentage of their territory has been affected already in the initial stages so that it will be difficult to cope with further withdrawals as development accelerates in the near future. Such assessments, under indigenous and local participation, should strive to encompass cumulative impacts, and full project life cycle costs. We encourage all sides to carry out such assessments even though they might not be explicitly required by national or regional legislation. The assessments require sufficient and independent funding that allows them to work thoroughly, with enough qualified personnel independent from companies and administration, and with adequate lead time to assure the highest quality assessment. Such assessments would contribute to local and regional capacity building, because herders would be integrated into the SE(S)A via e.g. traditional knowledge. Indigenous representatives should participate in choosing the personnel for these assessments. Adequate advance notificationfor development plans allows all sides to prepare for negotiations (prior informed consent and more). It is not enough to start the process after the official project timetable has started, because once the development is underway, and proper negotiations are scheduled, there is no time for thorough discussions any more. An important instrument for implementation and enforcement measure would be the power to veto a development plan if not given enough time to assess its impacts. Formal consultations require extensive preliminary informationto allow for proper advance preparation. This is best executed in person with informed representatives to handle discussions, rather than issuing documents. This goes beyond the scope of the present law but in this instance the law does not provide for adequate notification and preparations. The provision of full information and an atmosphere of mutual trust are best facilitated when industry representatives travel to tundra camps to introduce plans without time constraints and, if necessary, stay over night. Similarly, tundra nomads need to be transported to preparatory meetings that take place in villages and towns and given a possibility to express their views and remarks independently. Both the administration and companies should implement mandatory consultations and transparencyconcerning all issues. This probably requires specifying mandatory locations for consultation into the statutes, e.g. on the tundra, in villages, and towns. Consultations should not be carried out in conjunction with festivals and holidays (such as ‘day of reindeer herders’, ‘day of victory’, or other celebratory occasions). All parties have to agree to a zero-alcohol policyduring the consultations, and all parties should have the right to request repetition of meetings in cases of drunkenness of participants. Parties should have the right to appoint independent observers or rapporteurs without vested interests to the consultations. Competent, professionally trained and independent negotiatorsshould be appointed by herders. This ensures that consultations are carried out with the right people, not only with official indigenous associations, and will be non-confrontational in nature. Agreements are necessary at different levels. For example, both (i) framework agreements (between a company and a state-authority in the region / municipality), and (ii) individual agreements (between a company and a particular community impacted by the development). Establish (informal) mid-level working groups(boss of deposit / boss of brigade / village representative) that can make suggestions on the project planning stages, construction, and monitoring stages. Companies would do well to consider the long-term experienceof their mid-level staff with their extensive experience on particular deposits and their knowledge of and contacts with the reindeer herders and their actual needs. Such experienced staff could be extremely valuable to the planning of new developments, especially during infrastructure construction phase. In addition to transparency, decision-making and responsibilitiesshould be decentralised wherever possible, e.g. local oil spill response, tidying up, etc. Chains of command should be clear and consistent and including all subcontractors along the supply chain. Contract standards and requirements should be harmonized. More effort should be made to raise awarenessamong different levels of stakeholders. Contact and dialogue programmes would raise this awareness and enhance all sides’ understanding of processes within industry, the administration, and on the tundra (e.g. how contemporary herding/fishing really operate within a modern gas/oil field). It is significantly more efficient to invest in indigenous enterprisesthat maintain a diversity of viable livelihoods, rather than only providing for budgets and compensations. (Better to give a fishing rod than fish). Benefits should be distributed to local populations to create an ‘enabling environment’ for their own development. 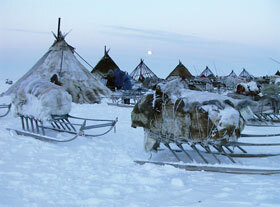 In-kind assistance from companies to tundra residents has to be decentralised and organised locally (on the spot). While herders should not get staples, food and equipment for free (as this can have detrimental effects on work ethics), it is unacceptable that they have to pay black-market prices for fuel or staples at triple the price paid by village residents (as happened in Varandei). Companies should allow for full-scale trading with tundra residents at all their local installations. Companies can help to promote indigenous production. Cooperative management (co- management) and transparency are necessary for managing these flows of money. For preventing dependence and corruption. A development fundfor indigenous people is necessary to ensure a future after the gas and oil are depleted. We encourage wider appreciation of the utility of high quality impact assessments, such as e.g. “Cumulative Environmental Effects of Oil and Gas Activities on Alaska’s North Slope” (2003, National Research Council USA). We call for better incorporation of indigenous and local expertise in future assessment efforts. Three-way capacity building requires the mastery of diverse skills, e.g. (i) capacity building for herders to more productively engage with industry and administrative personnel; (ii) for oil workers to better engage with herders; and (iii) for government to know how to deal with both herders and oil workers. Strengthen coexistence through local exchange networksbetween the industry and the tundra population. In particular, industry workers should secure their supplies of meat, fish, and berries directly from tundra residents instead of competing with them over these resources. This also ensures that fishing and hunting are carried out by experts with the best knowledge of the particularities of the tundra social-ecological system. Financing should be guaranteed for independent, peer-reviewed, high quality scientific researchwith complete transparency of information from all research projects, financed by either the state or by companies. In particular, company-funded science results should be made accessible for herders and the state and science on all levels. Local and indigenous expertise should be considered alongside scientific expertise within research projects. Scientists, indigenous and local representatives carrying out research in conjunction with oil and gas projects must all be allowed to freely use and disseminate the informationobtained. Companies must exclude from contracts all conditions requiring the confidentiality of research and the research team should retain the rights to publish such research, except for confidential economic information about the companies ?r physical persons. Indigenous representatives must be allowed to use the results of their own research for obtaining degrees as part of their capacity building. The right of final review of all research must rest with the authors of this research, and not with consulting firms hired by oil companies or with the oil companies themselves. Research can contribute concretely by facilitating state-of-the-art mapping that is tailored to the specific scales and parameters necessary to mitigate negative interactionsbetween herders’ migration routes (fishing places, sacred sites, campsites) and infrastructure (pipelines, roads, quarries, etc.). Alternative pipeline routes can be planned on the basis of such studies but this requires meaningful and non-confrontational consultationwith companies and workers in the early stages of the planning process. Monitoring to determine compensation demands can be made easily on the basis of detailed and repeat satellite imagery. There is a common motivation to strive for accurate and consistent monitoringamong herders and the local administration. Both parties require accurate information concerning affected lands, since herders need pastures, and the administration receives returns to the budget according to the impacted territories. It is not just a matter of affected territory since a successful monitoring process also brings significant financial returns to the state budget. Mapping should be done in cooperation with trained representatives of indigenous peoples. Such studies are expensive but can be initially focused on mapping ‘hot spots’where needs are prioritized because of tight development schedules, indigenous concerns, etc. The state could channel funding for training seminars and field research requested by indigenous organizations to prepare for specific developments. Indigenous organisations with herders should identify these hotspots and initiate the research (contracting science themselves). 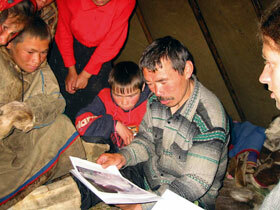 It is mutually beneficial to incorporate tundra residents’ knowledge into development plans. This involves working closely with herders. Herders have expressed their willingness to do so. pipeline and road crossings of all rivers should be constructed without temporary river-blockages, and without damage to the streambed and water channels that are important for migratory fish. reduce flaring of accompanying gas to the absolute minimum and ceased completely wherever technically possible. This valuable energy resource should be used as fuel. Complying with the conditions mentioned above contributes to safeguard a permanent nomadic lifestyle on the tundra while simultaneously developing oil and gas deposits. Doing so will significantly increase the rating of the Russian North worldwide as a region of industrial development with minimal environmental footprint and a healthy nomadic culture.